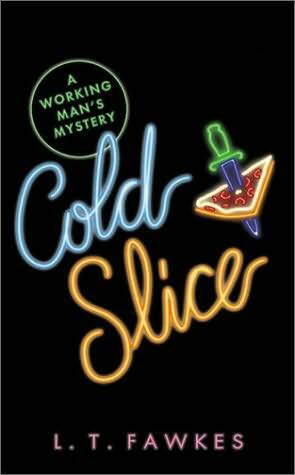 If you like plenty of pepperoni and provolone with your murder mysteries, “Cold Slice” by L.T. Fawkes is the supermarket paperback for you. “Cold Slice” (2003, New American Library – Signet, New York, N.Y., $5.99, 261 Pages) is billed as “A Working Man’s Mystery” but it’s much, much more. Like all the best supermarket paperbacks, “Cold Slice” has everything – homicide, intrigue, bikers, tomato sauce, surly waitresses, high-speed Hyundai crashes and a gourmet cop. “Cold Slice” is the story of rough-around-the-edges carpenter Terry Saltz, a long-haired, mustachioed guy who likes power tools and is kind of dangerous to be around when he’s had too much beer and exotic smoking substances. As luck would have it, the aforementioned combination of mood enhancers lands him in jail one night after he turns into a self-described “one-man riot” and demolishes a tavern. Saltz goes to jail, winds up on probation and subsequently loses his job, his wife, his home and his truck. He really, really misses the truck. Fortunately our combative carpenter lands on his feet. He’s assigned a grandmotherly probation officer who also likes power tools and he manages to get a job as a driver for Carlo’s Pizza in strategically unimportant Spencer, Ohio. There he meets a chaotically dysfunctional family of fellow employees known as Bump, Princess, Hammer, Gruf, Flute and The Witness. The latter character proves to be pivotal to our supermarket paperback murder mystery because he’s really weird, incessantly draws pictures of torture and violence on Styrofoam cups, gropes the pizza girls and, eventually, gets his throat cut from ear-to-ear following an otherwise routine pizza delivery. Our protagonist doesn’t particularly like The Witness, but he doesn’t particularly like cold-blooded murder, either. Besides, it leaves Carlo’s Pizza one driver short. Saltz, although he ain’t exactly Miss Marple, is determined to solve the murder and find the killer. He quickly discovers that he’s got plenty of potential suspects. Everybody at Carlo’s has threatened to kill The Witness on one or more occasions. Saltz himself dunked The Witness in a restaurant sink after the goofy little deliveryman annoyed one of the female employees. Complicating Saltz’s search for the killer is the fact that he’s on probation for demolishing a tavern in a decidedly violent manner. Suddenly, he’s at the top of the local cops’ most-likely-to-be-homicidal list. Further complicating matters is Saltz’s ex-wife, who decides that she really wants to get back together with him. Will Saltz be able to find the killer, lose his ex-wife and still deliver piping hot pizza? Motivate yourself over to the nearest supermarket paperback aisle and find out. Originally published August 31, 2003.